Four years after the end of the Civil War, Indianapolis, Indiana, was the unlikely destination of one of the nineteenth century’s most famous and daring archaeologists. Though he didn’t come here for a dig. In 1869, just before setting off for Turkey, where he astounded the world by excavating the long-lost city of Troy (so lost that most experts thought it was mythic), Heinrich Schliemann came to Indiana’s capitol city with an unusual goal: to get a divorce from his Russian wife, who lived on the other side of the globe. The Journal article was based mostly on interviews with two of Indianapolis’ most prominent Germans, who had known Schliemann during his short stay here. Adolph Seidensticker was the well-respected editor of the Indiana Volksblatt, at a time when probably a quarter of the city’s newspaper readers still got their news auf Deutsch. 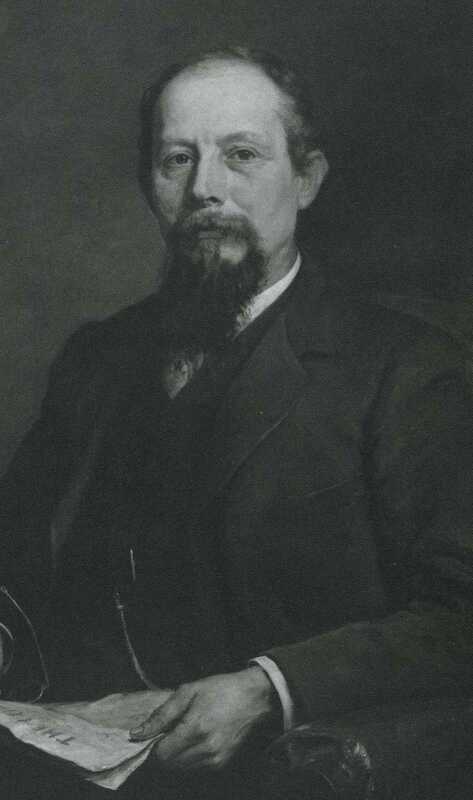 Herman Lieber was a prosperous frame merchant, art dealer, and soon one of the founders of Das Deutsche Haus, the center of German life here in the 1890s. (When the U.S. went to war against Germany in World War I, the unpatriotically-named building was renamed “The Athenaeum.”) Lieber’s nephew, conservationist Richard Lieber, was a reporter for the German-language Indiana Tribüne and later founded the Indiana state park system, saving Turkey Run and McCormick’s Creek from the lumberman’s axe. Herman Lieber, frame-maker and art dealer, remembered meeting aspiring archaeologist Heinrich Schliemann in Indiana. 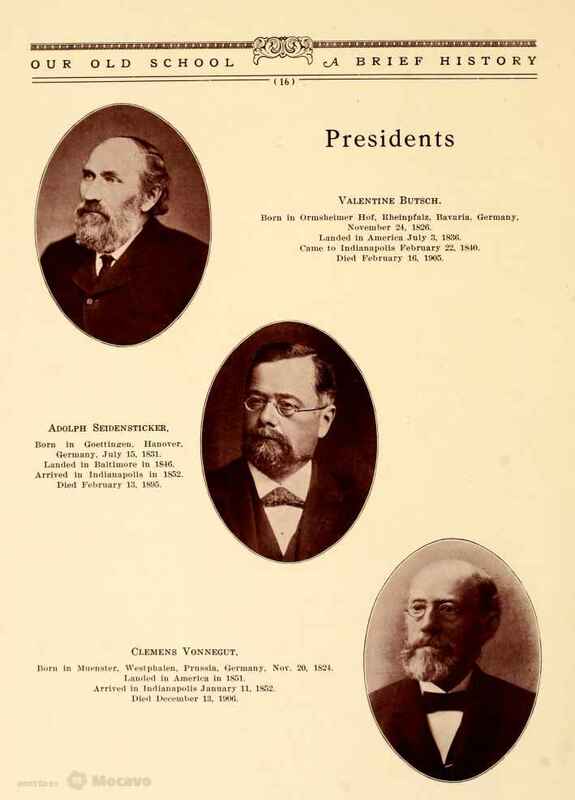 In addition to editing the Indiana Volksblatt, Adolph Seidensticker, center, worked as one of Schliemann’s divorce attorneys and served as president of the German-English Independent School, a bilingual school on Maryland Street at the current location of the Marion County Jail. He is pictured here next to Clemens Vonnegut, great-grandfather of the novelist Kurt Vonnegut. Seidensticker’s father, George, was another newspaperman and was once imprisoned in a Hanoverian dungeon. When Heinrich Schliemann — obsessed with dreams of Achilles, Agamemnon and the ten-year siege of Troy — showed up in the Greek-sounding town of Indianapolis in April 1869, the place was remarkably German. Lockerbie Square was often called “Germantown.” In that neighborhood especially, Schliemann would have found a thriving cultural mix of radical German freethinkers, refugees from the failed 1848 revolutions, and “confessional” Lutherans who left Germany to avoid government meddling with their worship. Born in a port town on the Baltic in 1822, the future archaeologist grew up in the duchy of Mecklenburg, which later became part of East Germany. His father was a Lutheran minister. His mother reviewed books, including Mary Shelley’s Frankenstein. In his memoirs, Schliemann claimed that his minister father, who was soon chucked out of his church for mishandling funds, read him long passages from Homer’s Odyssey and Iliad as a boy, cultivating a fertile imagination. (Elsewhere he claims that he took an interest in Homer when he heard a drunken man recite part of the Greek epics in a grocer’s store where he worked as a teenager.) If we can trust his memoirs, by age eight Schliemann vowed to find the lost Trojan capital. But with his family sunk in poverty, the fourteen-year-old was forced to drop out of school. At nineteen, bound for Venezuela as a cabin boy on the German steamer Dorothea, Schliemann was shipwrecked off the Dutch coast. Stranded in Amsterdam, he went to work for an import business, becoming the firm’s agent in St. Petersburg, Russia, in 1846. It was then that his renowned aptitude for mastering languages took off. Seidensticker also remarked that the man’s amazing linguistic skills helped him rise out of poverty. His rise to fortune was based to some extent on his knowledge of the Russian language. . . It seems the person having in charge the Russian correspondence of the [merchant house in Holland] having died suddenly, and they were in a quandary as to how to supply his place, Schliemann volunteered his services, but he was looked on with suspicion until he went to work with the correspondence, and showed them that he had really mastered the language. Hearing of the death of his brother Ludwig, who had struck it rich as a Forty-Niner in the California Gold Rush, he left Russia and sailed for the West Coast. Like his brother, Schliemann made a small fortune speculating in gold dust, enough to open a bank in Sacramento in 1851. 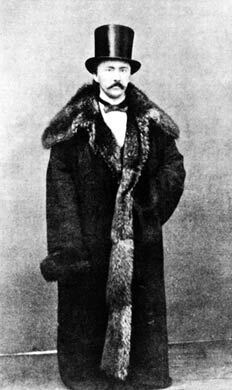 Crucially, for the later divorce proceedings that brought him to Indianapolis, Schliemann became an American citizen in California. Now a wealthy man, in 1852 he abandoned Sacramento and went back to Russia, where he married a woman named Ekaterina Lyschin. The couple eventually had three children. Growing even richer in the indigo and coffee trade, he made enough money to corner the market on ammunition and gunpowder during the Crimean War, selling military goods to the Russian government as it fought against the British, French, and Turks. 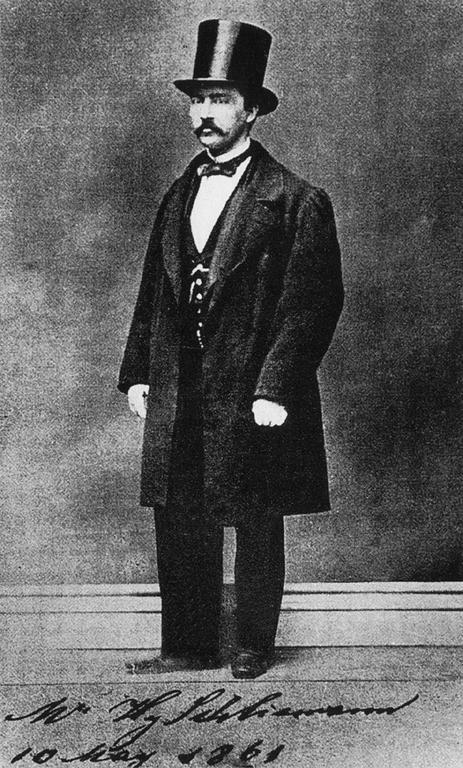 Schliemann effectively retired from business in 1858, aged only thirty-six. She was a Russian lady. . . He did not, for some reason, feel quite at home in Russia, and endeavored to persuade her to live elsewhere on the continent of Europe, but she would not consent. I think that she had three children by him. She was a devoted member of the Greek Church, and would not leave Russia because she wished to bring them up as orthodox Russians. The marriage was a failure. Though divorce was occasionally permitted by the Orthodox Church, in Russia it was scandalous and rare. Schliemann, however, had the advantage of being an American citizen. He even took an active role in a bitter debate then raging in the U.S. about legalizing divorce. Reno, Nevada, is known today as the world capital of the “quickie divorce.” But in 1869, it was Indianapolis. As Glenda Riley writes in her fascinating book Divorce: An American Tradition, Hoosier politicians had unwittingly turned Indiana into a notorious “freewheeling divorce mill” in the 1850s. 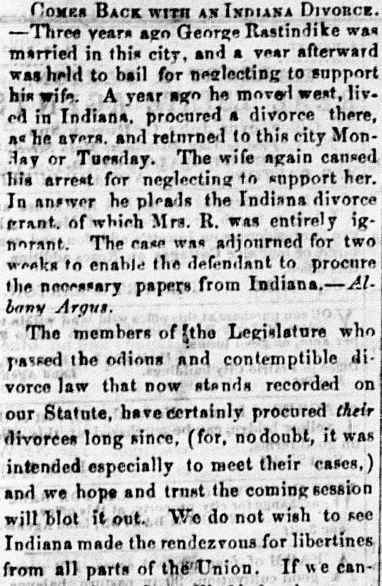 Though generally treated as anathema by most Americans, divorce had long been permissible under Indiana law, but only in cases of “bigamy, impotency, and adultery” and if a spouse had shown “extreme cruelty.” Yet only about a hundred divorces were prosecuted in Indiana from 1807-1840. The laws of the 1850s caused a drastic spike in the divorce rate, mostly due to out-of-staters coming here to take advantage of the courts. An 1858 editorial in the Indianapolis Daily Journal lamented that every railroad depot in the state was crowded with “divorce hunting men and women.” A District Recorder wrote to a New Yorker that he feared the new Indiana laws “shall exhaust the marriages of New York and Massachusetts.” William Dean Howells, a bestselling American novelist in the 1870s, spun the plot of his novel A Modern Instance around an out-of-state case rammed through Hoosier divorce court. The villain was a lecherous husband. As proof that Indiana was being made a mockery of, the Daily Union reprinted a clip from the Albany Argus in upstate New York. The paradise of free-lovers is the State of Indiana, where the lax principles of Robert Dale Owen, and the utter want of principle of John Pettit (leading revisers of the laws), combined to establish, some years since, a state of law which enables men and women to get unmarried nearly at pleasure. A legal friend in that State recently remarked to us, that, at one County Court, he obtained eleven divorces one day before dinner; “and it wasn’t a good morning for divorces either.” In one case within his knowledge, a prominent citizen of an Eastern manufacturing city came to Indiana, went through the usual routine, obtained his divorce about dinner-time, and, in the course of the evening was married to his new inamorata, who had come on for the purpose, and was staying at the same hotel with him. They soon started for home, having no more use for the State of Indiana; and, on arriving, he introduced his new wife to her astonished predecessor, whom he notified that she must pack up and go, as there was no room for her in that house any longer. So she went. 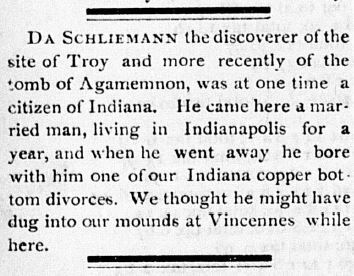 Amazingly, Heinrich Schliemann, who was already digging for Troy in Turkey, took a steamer over the Atlantic in his hunt for an “Indiana copper bottom divorce,” as the Terre Haute Weekly Gazette lampooned in 1877. Terre Haute Weekly Gazette, February 8, 1877. Hoosier State Chronicles. Several big reasons probably drove the “Dr.” here. Ekaterina — called “Catherine” in Indiana documents — was still in Russia and wasn’t likely to show up in Indiana to stop him. His American citizenship, acquired in 1851, required that he go to an American court. And he believed, probably rightly, that his work at Troy in the Ottoman Empire (traditional enemy of Russia) would be easier if he wasn’t married to a Russian. As everywhere in America, so here, too, Germans are greatly respected for their industry and assiduity as well as their solidity, and I cannot think back without alarm of Russia where the foreigner, and the German in particular, is despised because he is not a Russian. The Marion County court received perjured testimony that Schliemann was a resident of the United States. He also presented letters from his wife, written in Russian, with his divorce petition. 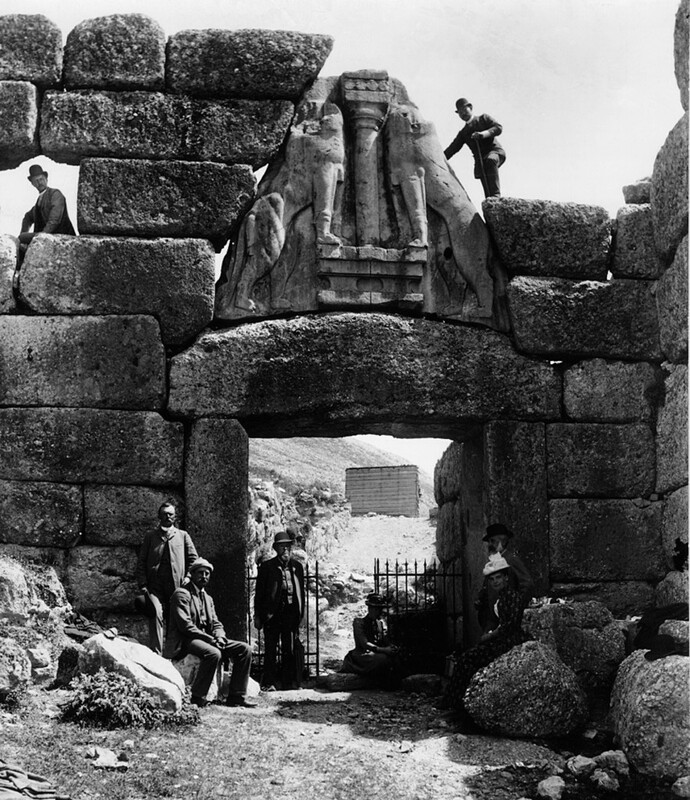 Schliemann, seated, with a group at the Lion Gate, part of the Bronze Age citadel at Mycenae in Greece. Schliemann excavated Agamemnon’s ancient capital in 1876. In 1889, a year before his death, the archaeologist drew up a will. Called the “Last Testament of a Millionaire savant” by the Indianapolis Journal in September 1891, it was sent to C.E. Coffin & Co. from Odessa, Russia. 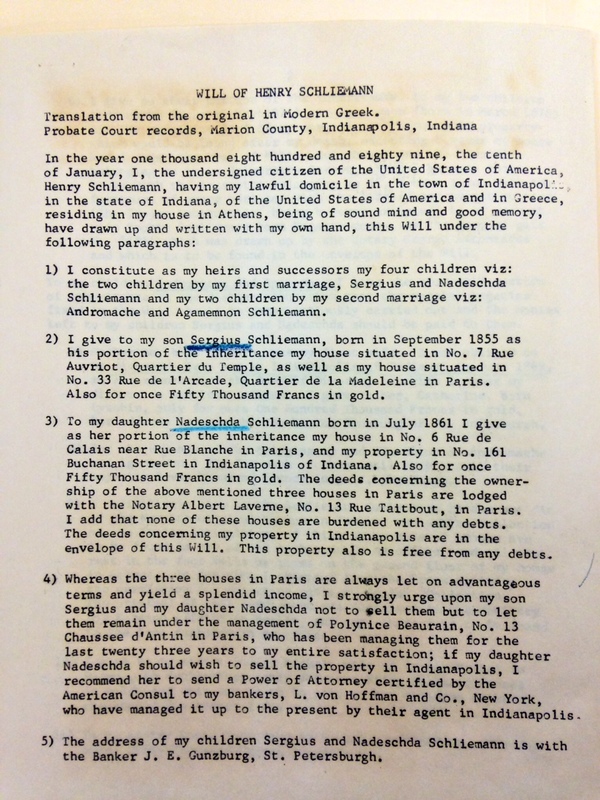 Written in Greek, an original copy of Schliemann’s certified will is on file at the Marion County Probate Court in the basement of the City-County Building in Indianapolis, where, twenty years after his only known visit to the city, he still claimed legal residency. The Indiana State Library has a translated typescript of Schliemann’s last will and testament. Stamped by the U.S. Consul in Athens, Greece, the original is on file at the Marion County Probate Court downtown. Indianapolis industrialist Eli Lilly, Jr., who was also a historian and archaeologist, had Schliemann’s letters and other documents related to his stay in the city translated and published in 1961. A typed translation can be found at the State Library. To his Russian daughter Nadezhda, the archaeologist left property at 161 Buchanan Street. 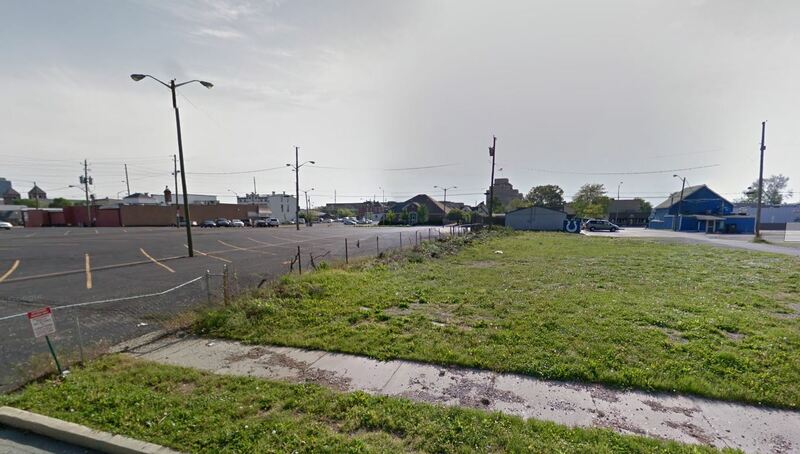 The address no longer exists, but was just north of what is now I-70 and is part of Eli Lilly’s downtown campus near Fountain Square. Nadezhda also got a house at “No. 6 Rue de Calais near Rue Blanche in Paris” and fifty-thousand francs in gold. 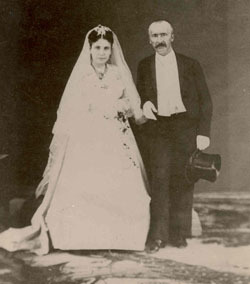 Schliemann hurriedly married his second wife, 17-year-old Sophia Engastromenos, in Athens, just months after his divorce was finalized in Indianapolis. 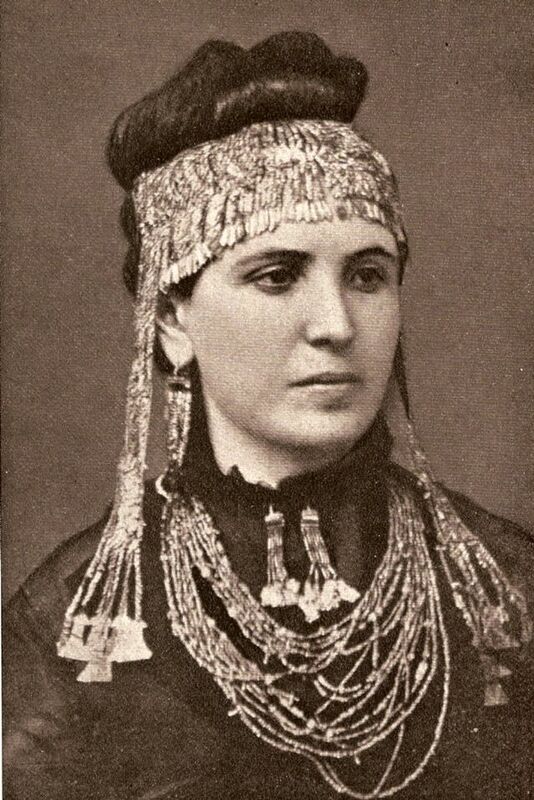 Around 1874, she was photographed wearing the “Jewels of Helen,” which her husband claimed to have discovered in the ruins of Troy. Sophia died in 1932.